For the November 2018 episode of Data Dump, Mark Godley, CEO of LeadGenius, chats with Maria Grineva, CEO and Co-Founder at Orb Intelligence, about her experiences as a serial entrepreneur in the data space over the last decade. What sets Maria apart from the pack is that she has built her companies without venture capital funds. This has allowed Maria to create companies at her own pace, grow organically and create products that she and her team have complete control over. Maria has a perspective on the industry that we all wish we had...pure and free! 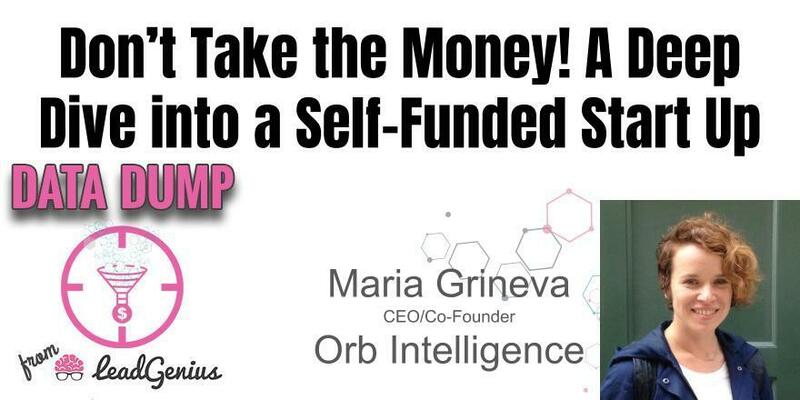 Join us this month to get the scoop on how Maria is growing and expanding Orb Intelligence on her own terms. Maria Grineva (Grin-yella) is a computer scientist and tech entrepreneur. Over the last 10 years, she has built two successful technology businesses. Currently, as a Founder and CEO of Orb Intelligence, Maria's mission is to bring high-quality firmographic data and advanced tools to use it to fuel B2B advertising, marketing, and sales. Before starting Orb, Maria worked as a Senior Scientist at Yandex, where she led a team of engineers and scientists to build a social search product called Wonder. In 2009, Maria co-founded TweetedTimes, a personalized news service which was acquired by Yandex in 2011. In 2010, Maria co-founded Teralytics, a big data consulting services for Swiss corporations. Maria has a PhD in Computer Science from Russian Academy of Sciences with specialization in database systems, followed by two years in ETH, Zurich as a postdoc in Database Systems group. She has published her research work at prestigious academic conferences: WWW, SIGMOD, VLDB, and others.